In August 2015 I went for a couple of wanders around the Layerthorpe area and took some photographs. I was so busy looking at the buildings that I didn’t notice until a follow-up visit this remnant of old Layerthorpe, underfoot. 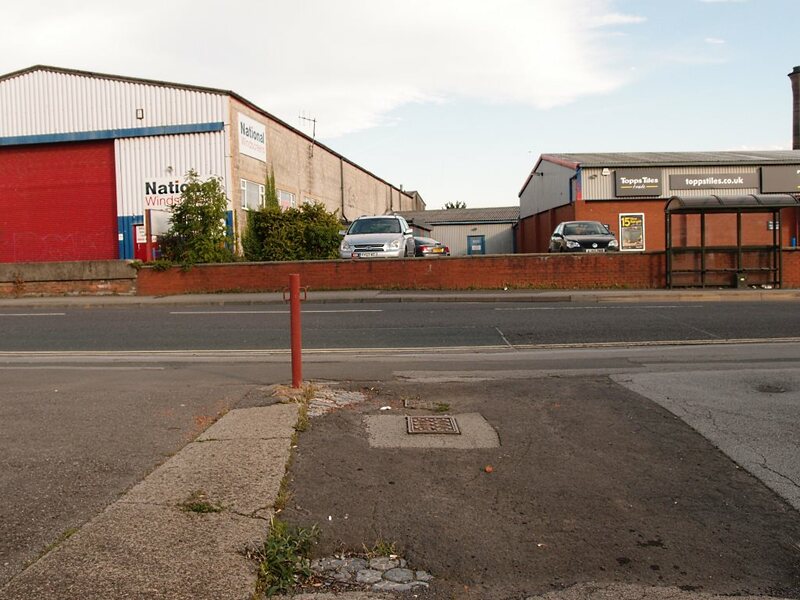 The street of Layerthorpe is now occupied by light industrial and commercial units, late 20th century buildings with forecourts. At the edge of one of these forecourts the tarmac has broken up in a couple of places to reveal the older surface beneath. 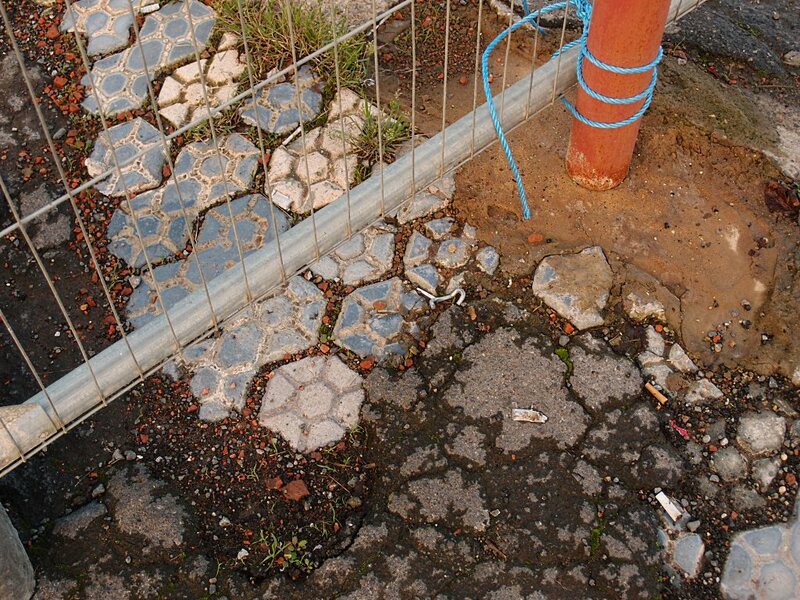 These are the distinctive hexagonal paviours common in many of the city’s 19th century back alleys. We’ve admired them before on the York Stories site. They were also used at road edges, as can be seen in streets off Burton Stone Lane (and presumably many other areas of York). So this paving marks what was the edge of a road or a wide back alley, or perhaps the entrance to a yard or passageway. But which one? Downhill Street perhaps? Chicory Yard? The long-vanished Portland Place, shown on the 1852 map? Here’s the location from a different angle (taken on an earlier visit, before the steel fencing blocked it off). I’m standing in what would have been the road/alley/passageway in question, looking across to the other side of Layerthorpe. On my right, not far away, was the most prominent remnant of old Layerthorpe: a building housing the ‘Hungry Horace’ café. An obviously 19th century building, which we’ll cover on another page. Apart from that it’s hard to find landmarks to help place and name this road/alley, as it was. It’s very difficult, standing in the middle of that massively changed landscape, to work out where the old 19th century streets used to be. Bilton Street has vanished completely. Redeness Street is still there but it doesn’t run in a straight line to meet Layerthorpe as it used to — it bends away behind the buildings since erected on the Layerthorpe entrance, and emerges on Hallfield Road. Below I’ve included the link to the relevant bit of Google Street View, and a link also to the relevant bit of the 1852 map. If you can identify what street/yard these old paviours mark, please add a comment. To link to this page's proper location please use the > permalink. Trev; I have a photo; of the Pearson girls I could send it to you.